If you’re like many kids today, you have shelves or boxes full of books in your house that you’ve outgrown and never even look at any more. But imagine being a kid who didn’t own any books. Or who didn’t have a library nearby. Sadly, there are lots of kids just like that… because when people are poor, they can’t spend money on extras like books. But you can help these kids by collecting and sending used books to us here at Family-to-Family. First ask an adult to supervise what you’re doing. Then contact Family-to-Family at booksforlife@family-to-family.org and tell us you’d like to do a book drive. 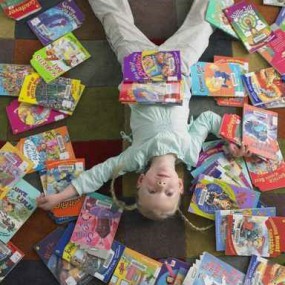 We’ll distribute your books to a local organization serving children in need; kids who don’t have many books. Some of these organizations have set up lending libraries in extra rooms for donated books. Some give the books out at home visits, or when the families come to pick up their food boxes. You can send your own books, or collect books from neighbors. You can organize a book drive through your school. Ask your principal if you can send home a flyer to all the families at your school asking for book donations. Ask people to bring them to the school. Label a few boxes so people will know where to drop them off. If you’d like your collected books to benefit our GivingWorks Empathy Project, email us for details! Then, pack your books in a sturdy box and mail them. It will cost some money to send them — you can ask neighbors for donations, or have a bake sale or a yard sale to raise the money. Note that the U.S. Postal Service has a book rate, which is significantly cheaper than sending a 1st-class package. Remember, the books can look used, but shouldn’t be dirty or falling apart. And not every single book will be useful – so we’ve included a list of the best kinds of books to send.